SRA Home Products’ pergolas provide Blue Bell, Pennsylvania residents with a simple yet refined way to restyle their backyards. With some comfortable lawn furniture placed underneath, a pergola can be a spot for you and your friends to relax and chat. With a grill, a table, and chairs, it’s an outdoor kitchen and dining area. Or with a spa, it’s a tranquil spot to unwind after a long day. No matter how you choose to style your pergola, it will be an eye-catching piece that will add that little something extra to your landscaping. 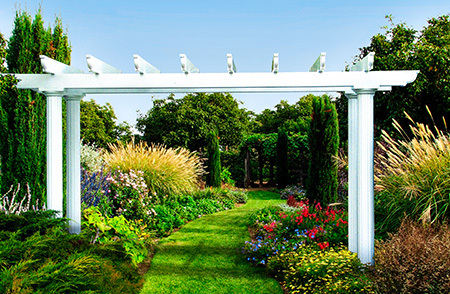 Style — Our pergolas come in three styles: attached, free-standing, and garden arbor. Columns — You can choose among three column styles inspired by the Mediterranean region: Roma, Venetian, and Florentine. 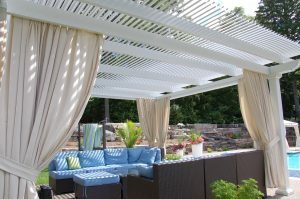 Color — Our pergolas are available in two colors: white and sandstone. 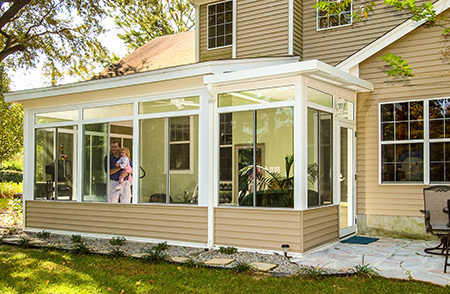 Operability — You have the option of choosing an operable pergola, which includes rafters that you can open or close using a slow-motion motor, enabling you to switch from a pergola to a solid-roof cover, and then back to a pergola again. We install pergolas manufactured exclusively by TEMO, one of the foremost authorities on outdoor living products in the United States. TEMO’s products, including their pergolas, are constructed using heavy-duty extruded aluminum, a material so durable that it will stand the test of time. Customers who purchase one of our pergolas also enjoy the benefits of TEMO’s limited lifetime transferable warranty, which they can pass on to a new owner should they ever choose to sell their home. If you’re a Blue Bell, PA resident who would like to discuss installing one of our charming pergolas, please contact us so that our design team can go over all of the options available to you. Our staff is knowledgeable and experienced, so you can rest assured that they’re qualified to answer any and all of your questions.